Park Kelvin Kyung Kun is an artist. 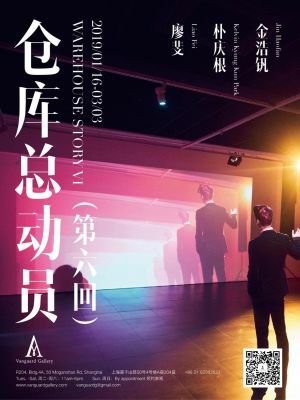 At the beginning of the New Year, Vanguard Gallery is presenting paintings and video installations works by Jin Haofan, Liao Fei and Kelvin Kyung Kun Part for the Warehouse Story series this year. Jin Haofan was tired to construct figure and scene constantly to show the anxiety and self-doubt through strange scenario from the early time. In his recent works, He try to reduce too much imagination and want to get rid of his personal feelings of the one-sided narration, instead of concerning the imagination of "emotion", which has been disturbed by all kinds of troubles and problems. For Liao Fei, working begins from the doubts he had about surroundings and himself. Liao has strong suspect about duality, but on the other hand, he holds severe interest in the aesthetic feeling based on that. This has encouraged him to practice his creation and took "material" as a clue from 2011. He gradually expanded his working scope to the measurement based on duality and the system itself. He continuously pays close attention to the construction and operation of cognitive system, and the presentation of power discipline in the spatial planning. He uses installation, video and other channels to reveal the absurdity under the seemingly reasonable surface. In this exhibition, we will present Liao’s early drawings and paintings, which help to better understand his current works by tracing back to the origin of his artistic creations. Kelvin Kyung Kun Park has been engaging with film & video practice for the past decade. His work walks through the labyrinth of the recent industrial history, the military trauma and psychology of pop culture in South Korea.Stairway to Heaven is a live video performance based on the popular K-soap opera, "Stairway to Heaven"(2003), which reveals structures of emotions for romance. Characters in a double love triangle make emotional decisions based on relational situations rather than having their own subjective drive, or will. A non subjective subjectivity is the archetype of emotional structures of Asian soap operas. The exhibition will be open for view starts from January 1st to March 3rd. Jin Haofan was born in Guangdong Province in 1987. He graduated from Oil Painting Department from Sichuan Fine Art Institue in 2010. Jin now works and lives in Shenzhen, China. Recent exhibitions include: Shenzhen biennale of Contemporary Art, Shenzhen, China(2017); Good Night, ldiot, Tenjinyama Art Studio, Sapporo, Japan(2016 solo exhibition); Sullivan’s Attic, MOU Art, Beijing,China(2016); MTRRAGE(with He Shaotong), Gallery 55, Shanghai, China(2015 solo exhibition). Liao Fei was born in Jiangxi in 1981. He graduated from Shanghai Normal University in 2006. He is now Based in Shanghai. Recent exhibitions include: Res Extensa, Vanguard Gallery, Shanghai, China(2018 solo exhibition); Botanic Project, Busan Museum of Art, Busan, Korea(2018); Frontier:Re-assessment of Post-Globlisational Politics, OCAT Institute, Beijing, China(2018); The 5th Huayu Youth Award, Huayu Art Center, Sanya, China(2017); Shanghai Galaxy Ⅱ, Yuz Museum, Shanghai, China(2017); Today’s Yesterday - Anren Biennial, OCAT, Chengdu, China(2017); All happens after sunset…, MOCA Pavilion, Shanghai , China(2017); Any Ball，CAFA Art Museum, Beijing, China(2017); The New Normal: China, Art, and 2017, UCCA, Beijing, China(2017); The 11th Shanghai Biennale "Why Not Ask Again: Arguments, Counter-arguments, and Stories”, Power Station of Art, Shanghai, China(2016-2017); Plain, Shanghai Museum of Glass, Shanghai, China(2016 solo exhibition); Perspective, YveYang Gallery, Boston, USA(2016 solo exhibition); The Equater, Vanguard Gallery, Shanghai, China(2016 solo exhibition). Kelvin Kyung Kun Park is an artist based in Seoul, Korea, working primarily in the medium of film & video, photography, and installations. In 2018, he won 2018 BIFF Mecenat Award (Documentaries). He has screened his highly acclaimed first full-length film, "Cheonggyecheon Medley", 2010, at various international venues, including the Berlin Film Festival, Busan International Film Festival, Warsaw Planet Doc Film Festival, Los Angeles Film Festival, Hot Docs, among others. Park’s video installation works have been shown at the Ilmin Museum of Art in Seoul and Daegu Art Museum, Arko Art Gallery, Opsis Art Gallery, and the 2012 Taipei Biennale. Park followed his debut up with "A Dream of Iron", which debuted at the Berlin International Film Festival. The film featuring a series of visual tableaux filmed at the Pohang Steel Company and Hyundai Shipyard, won the NETPAC Award at Berlinale and subsequently played at the Museum of Modern Art in New York and at the Sharjah Bienniale. Recent exhibitions include: Busan Biennale 2018, Busan, Korea(2018); Our Bright Future—Cybernetic Fantasy, Nam June Paik Art Center , Seoul, Korea(2017); A Dream of Iron, Sin Ricoh Gallery, Seoul, Korea(2016 solo exhibition); Stopping by Woods on a Snowy Evening, Gallery Hyundai, Seoul, Korea(2016 solo exhibition); Intuitive Landscape, Arario Gallery, Seoul, Korea(2016 solo exhibition); ARTSPECTRUM 2016, Leeum Samsung Museum of Art, Seoul, Korea(2016 solo exhibition); Brilliant Memories, Buk Seoul Museum of Art, Seoul ,Korea(2016); Korea: 70th Anniversary of Liberation, National Museum of Modern and Contemporary Art, Seoul, Korea(2016); Resonating Triangle, ARARIO Museum, JEJU, Korea(2016); Obejectology II: Make, National Museum of Modern and Contemporary Art, Seoul, Korea(2016).